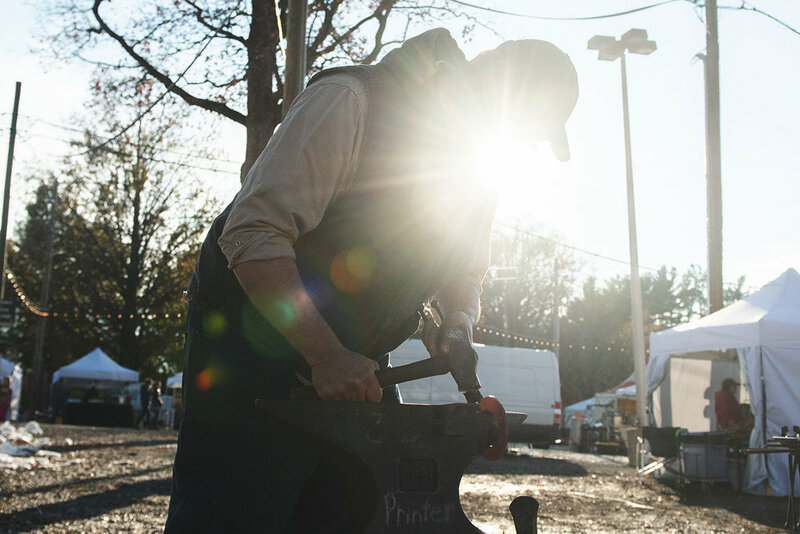 Don’t miss your last chance of the spring to experience one the biggest craft shows on the east coast! Sugarloaf Craft Festivals concludes its Spring Tour at the Maryland State Fairgrounds in Lutherville-Timonium, MD. Be there for three days of sharing in the wonder of high quality fine arts, crafts and design. Sugarloaf Craft Festivals has carefully selected more than 250 of the best local and national independent artisans to showcase their original handmade goods. But a Sugarloaf artist brings more than just their work – they bring their passion, knowledge and vibrant personality. Every time something catches your eye, you’re sure to get a story about it from its creator. All ages, backgrounds and education levels are welcome at a Sugarloaf Crafts Festival – the only requirement is a love and appreciation of fine arts and crafts. That love will be stoked everywhere you turn as you rekindle old passions and discover new ones. Whether you’re looking for designer clothing, gemstone jewelry, metal and glass sculptures, oil paintings, wearable art or pottery dishes, you’ll find all these and more. Add to your personal collection or find a great gift for a friend with something for any budget. The experience doesn’t end there, though, as you can check out a number of live art demonstrations and workshops. 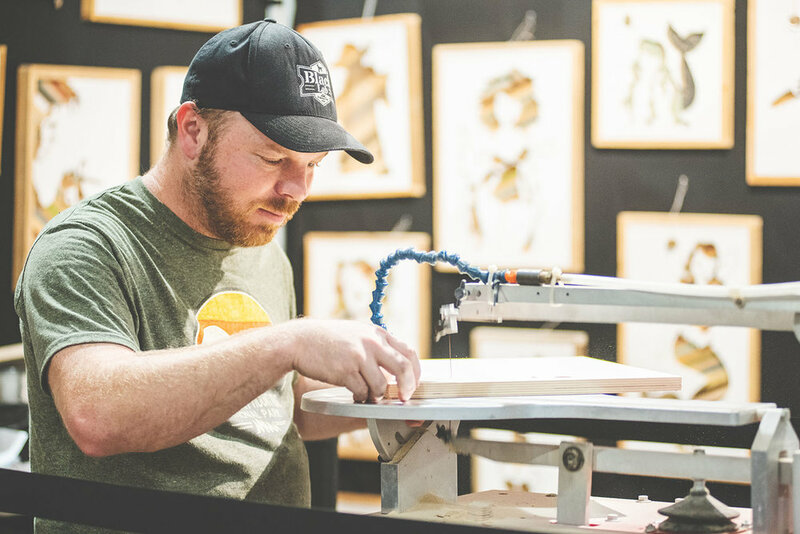 Get a glimpse of the process behind their wondrous creations from the same artists and craftspeople you’ve just met on the festival floor. All the while, you can enjoy live music from talented local and regional artists. Be sure to visit an array of artisan food vendor for the finest gourmet nut butters, truffles, cheese and other delicacies. There’s even fun entertainment for the kids. Buy your tickets online and save on one of the best spring festivals in the Baltimore area, rain or shine! Our artist and entertainment listings are always being updated with the latest additions to the event. You can also get directions to the Fairgrounds, find a coupon for in-person ticket purchases, or learn how to get discounted rates at local hotels. For additional information, you can contact us or check out our Frequently Asked Questions. There's something for everyone to love at Sugarloaf Crafts Festival! Lovers of fine crafts and art will find more than 250 top artisans displaying and selling their unique creations in pottery, sculpture, glass, jewelry, fashion, home décor, furniture and home accessories, items for the garden, and photography. In addition to top national artists, the Festival will also introduce new and emerging artists showcasing the latest trends in handmade fashion and accessories, statement jewelry and fine art. The Sugarloaf Crafts Festival in Timonium also features interactive demonstrations with master craftspeople. Many of the talented artists at the show will introduce visitors to how they create their art; demonstrations include wheel thrown pottery, wood turning and metal spinning. The show is conveniently located just north of Baltimore in Timonium, MD. From I-695, take I-83 North (Balt. Beltway Exit 24) to Padonia Rd. East (Exit 17). For closest weekend parking, turn right onto Deerco Rd. and park in the light rail commuter lot on the left, OR continue on Padonia Rd. and turn right onto York Rd. (MD-45) to Fairgrounds entrance on the right (about 4 miles from I-695). Visiting the show from out of town and looking for a place to stay? Sugarloaf has special rates at Timonium hotels! Make your reservation early, as rooms available at these special rates are limited. Be sure to request the "Sugarloaf Rate" when making your reservation! 3 miles from show site. When using GPS, please use “Cockeysville” as city. From airport, take I-195 West to I-95 North. Take Baltimore Beltway I-695 North toward Towson. Take I-83 North (Balt. Beltway Exit 24) to Padonia Rd. East (Exit 17). For closest weekend parking, turn right onto Deerco Rd. and park in the light rail commuter lot on the left, OR continue on Padonia Rd. and turn right onto York Rd. (MD-45) to Fairgrounds entrance on the right (about 4 miles from I-695). Take I-95 South to Baltimore Beltway I-695 West toward Towson. Take I-83 North (Balt. Beltway Exit 24) to Padonia Rd. East (Exit 17). For closest weekend parking, turn right onto Deerco Rd. and park in the light rail commuter lot on the left, OR continue on Padonia Rd. and turn right onto York Rd. (MD-45) to Fairgrounds entrance on the right (about 4 miles from I-695). From Hagerstown/Frederick,MD: Take I-81 South to I-70 East to Baltimore Beltway I-695 North toward Towson. Take I-83 North (Balt. Beltway Exit 24) to Padonia Rd. East (Exit 17). For closest weekend parking, turn right onto Deerco Rd. and park in the light rail commuter lot on the left, OR continue on Padonia Rd. and turn right onto York Rd. (MD-45) to Fairgrounds entrance on the right (about 4 miles from I-695). Take I-495 toward Baltimore to I-95 North. Take Baltimore Beltway I-695 North toward Towson. Take I-83 North (Balt. Beltway Exit 24) to Padonia Rd. East (Exit 17). For closest weekend parking, turn right onto Deerco Rd. and park in the light rail commuter lot on the left, OR continue on Padonia Rd. and turn right onto York Rd. (MD-45) to Fairgrounds entrance on the right (about 4 miles from I-695). From Harrisburg/York,PA: Take I-83 South to Padonia Road East (Exit 17). For closest weekend parking, turn right onto Deerco Rd. and park in the light rail commuter lot on the left, OR continue on Padonia Rd. and turn right onto York Rd. (MD-45) to Fairgrounds entrance on the right (about 4 miles from I-695). Take Route 50 West to I-97 North to Baltimore Beltway I-695 West toward Towson. Take I-83 North (Balt. Beltway Exit 24) to Padonia Rd. East (Exit 17). For closest weekend parking, turn right onto Deerco Rd. and park in the light rail commuter lot on the left, OR continue on Padonia Rd. and turn right onto York Rd. (MD-45) to Fairgrounds entrance on the right (about 4 miles from I-695). From Waldorf/Upper Marlboro/Bowie,MD: Take Route 301 North to Route 3 North. Take I-97 North to Baltimore Beltway I-695 West toward Towson. Take I-83 North (Balt. Beltway Exit 24) to Padonia Rd. East (Exit 17). For closest weekend parking, turn right onto Deerco Rd. and park in the light rail commuter lot on the left, OR continue on Padonia Rd. and turn right onto York Rd. (MD-45) to Fairgrounds entrance on the right (about 4 miles from I-695). Take either I-66 East or the Dulles Toll Road East to I-495 toward Rockville/Baltimore. Take I-95 North to Baltimore Beltway I-695 North toward Towson. Take I-83 North (Balt. Beltway Exit 24) to Padonia Rd. East (Exit 17). For closest weekend parking, turn right onto Deerco Rd. and park in the light rail commuter lot on the left, OR continue on Padonia Rd. and turn right onto York Rd. (MD-45) to Fairgrounds entrance on the right (about 4 miles from I-695). Public transportation to the Maryland State Fairgrounds is available Friday through Sunday via the Maryland Transit Authority Light Rail (Timonium station). Bus service is also available from the Towson area only (Bus #8). For detailed schedule information, please contact MTA directly at 410-539-5000 or vitit the MTA Website. Glass & copper fusion 3D art by Jim Flood embraces techniques used to create art since 1952. Explore the phenomenal artist family sculptures. Thomas Von Koch strives to channel characteristic energy into elegant and beautiful works of art. Locally made DIRT seasonings will cover all of your cooking needs this spring and summer! Todd's DIRT seasonings! Looking for a specific artist? 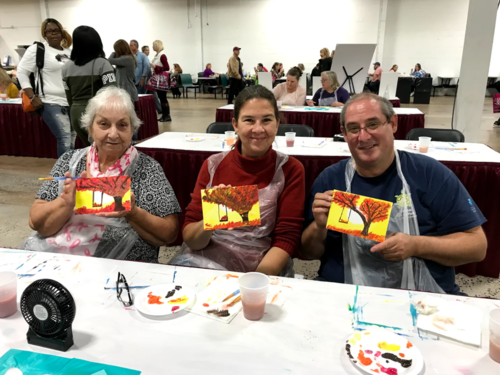 Search or browse Spring Timonium Artists, or contact us with any questions.